Ready to grill? Throw some bok choy on the BBQ! Bok choy is packed with vitamins A, C and K, as well as beta carotene. 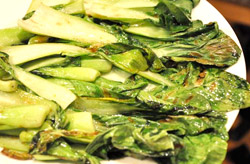 This grilled bok choy has tender stems and crispy leaf edges. Lay your bok choy on the prepared grill. Brush with the seasoned oil mixture. Cover grill and cook until stems show grill marks, about 4 minutes. Turn the bok choy, brush with more seasoned oil mixture and grill the other side.